We understand that being a traveling professional you want to be able to take your business everywhere you go. At Source One Beauty we carry portable massage chairs from your favorite manufacturers such as Creations, Touch America, EarthLite, ALVA and more. 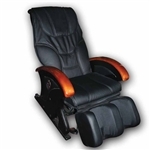 Be able to perform unforgettable seated services for customers by providing comfort and luxury even on a portable massage chair. We understand the importance of quality and that is exactly what we bring to you through our equipment. Check out all we have to offer in massage chairs, our products are stylish, compact, lightweight and can easily be adjusted, assembled and disassembled.